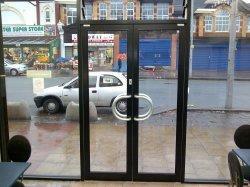 Aluminium front doors installed from new or replace old existing doors. Mane Shop Fronts manufacture and install nationwide all types of aluminium front doors for shops, offices and commercial premises. All of our aluminium front doors come with a 2 year guarantee and are manufactured from high grade aluminiumn and can be single glazed or double glazed. The doors can come with a variety of locks and can be powder coated to any colour you require. Mane also carry out aluminium front door repairs, we can replace door closers and floor springs when your door is slamming shut, replace bottom pivots when your door is catching on the floor and change all types of locks. All of the parts we replace are guaranteed for 2 years from the date of installation so please get in touch for a free quote by telephone or email.